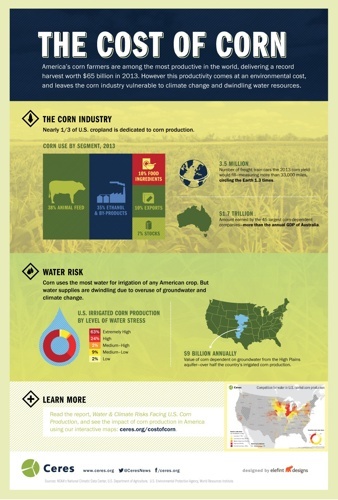 Water and Climate Risks Facing U.S. Corn Production: How Companies and Investors Can Cultivate Sustainability, provides new data and interactive maps on the risks facing U.S. corn production, as well as detailed recommendations for how corn-buying companies and their investors can catalyze more sustainable agricultural practices that will reduce these risks, preserve and enhance yields, and protect precious water resources. Free Webinar:Gaining Ground: Tracking Corporate Progress on the Road to SustainabilityJune 23, 201412:30-1:00 PM ETJoin Eric Roston, Sustainability Editor, Bloomberg Sustainability, Paul Boykas, Vice President of Global Public Policy, PepsiCo and Michael Jacobson, Director of Corporate Responsibility, Intel for a free webinar exploring how leading companies are embedding sustainability within their organizations, and what investors expect of a sustainable company in the 21st century. The Cost of Corn Did you know that the 2013 corn yield could fill 3.5 million freight train cars, enough to circle the earth 1.3 times? 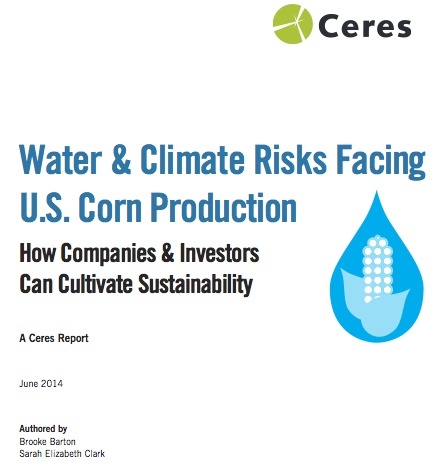 Or that corn uses the most water for irrigation of any American crop?Ceres’ new report, Water and Climate Risks Facing U.S. Corn Production: How Companies and Investors Can Cultivate Sustainability, analyzes the risks facing the $67 billion U.S. corn sector and makes recommendations for how corn-buying companies and their investors can catalyze more sustainable agricultural practices, while helping farmers preserve and enhance yields, and protect precious water resources.The report provides new data and interactive maps on wide-ranging threats to U.S. corn production, including extreme weather events, groundwater depletion in regions with heavy irrigation demand, and contamination of waterways from inefficient fertilizer use. In response to these risks, a growing number of food and retail companies, including Coca-Cola, PepsiCo and General Mills, are beginning to develop supply chain initiatives to encourage more resilient and sustainable agricultural production in the sector, which has nearly doubled in size in the past two decades. View the maps and learn more. 128 companies such as Unilever, Levi Strauss, VF Corporation, and Mars, Inc. to send letters of support to the Obama Administration, and to Senate and House majority and minority leaders – demonstrating that the business community supports taking action on climate change. The proposed standards are a critical to achieving the U.S.’ target of a 17% reduction in GHG emissions from 2005 levels by 2020 and moving towards a clean energy economy. “Quite simply, climate change poses a significant risk to the global finances, and our fiscal and ecological health depends on building a low carbon, energy efficient economy. The Carbon Pollution Standards released today will greatly serve that goal by providing a catalyst for clean energy solutions already at work in the United States”, said New York State Comptroller Thomas P. DiNapoli. The New York State Retirement Fund manages $176.2 billion in assets. 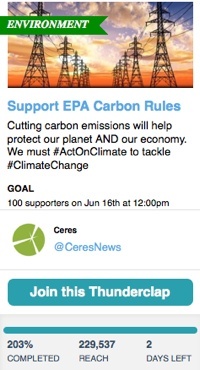 Ceres will continue to mobilize support for the rules, ensuring that company and investor voices are heard, showing that what is good for our environment is also good for our economy. Add your support by joining our Thunderclap campaign, launching Monday! Learn more and listen to the press conference. In the days leading up to the release of the EPA’s proposed carbon standards for existing power plants, Ceres released a new report analyzing U.S. power plant emissions from the country’s top 100 electric power producers. 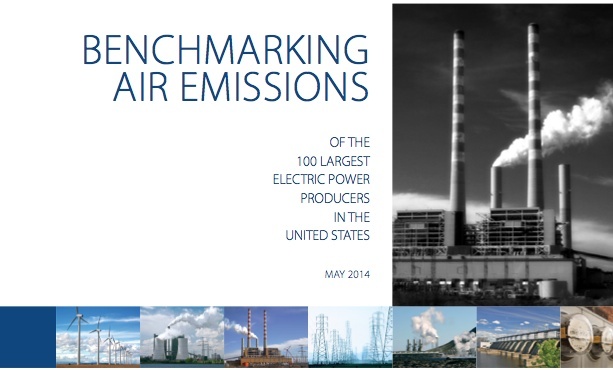 The report, Benchmarking Air Emissions of the 100 Largest Electric Power Producers in the United States 2014, shows that the industry is already shifting toward a combination of increased energy efficiency and lower carbon fuel sources, and has a successful track record of reducing air pollution emissions, while meeting the nation’s energy needs. Learn more and listen to a press conference with two major utilities, Entergy and Calpine. The Ceres Corporate Program is debuting a new online newsletter, “The 21st Century Corporation.” The newsletter, which will be issued on a quarterly basis, serves as a forum to share stories, resources and leading practices on corporate sustainability. Subscribe to this and other Ceres emails. Contact Kevin Maley, Manager, Corporate Program with any questions. Ceres network member EMC released its 2013 Sustainability Report,Thinking Forward: Redefining Our Future. The report details company progress towards achieving its sustainability goals and includes new performance targets for 2020. Addenda Capital, a Canadian investment management firm providing solutions for institutional and high net worth clients. Arjuna Capital, the sustainable wealth management platform of Baldwin Brothers, Inc.
Mirova, a European socially responsible investment firm, and the responsible investment subsidiary of Natixis Global Asset. The Sustainability Group of Loring, Wolcott & Cooldige is the sustainable investment group of Loring, Wolcott & Coolidge, a fiduciary services firm with a nearly 200 year history.